The phase separation process and catalyst recycling is a crucial step for process optimization in micellar multiphase systems. The subproject B8 seeks to analyze the phase separation time and efficiency of the micellar liquid/liquid systems under two-phase and three-phase conditions. Therefore, drop size measurements are performed in-situ with an endoscope technique and the sedimentation and coalescence process is monitored via an external camera. 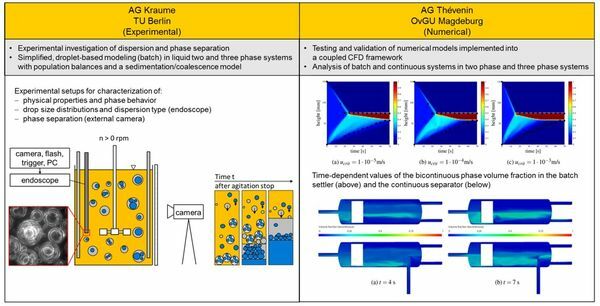 The effects of process conditions such as composition, temperature, agitation speed and reaction progress on drop breakage and coalescence phenomena are investigated in agitated systems. These are at the same time the initial condition for the subsequent phase separation process governed by drop sedimentation and coalescence. Previous work concerning the prediction of drop size distributions in agitated systems with Population balance equations and Computational Fluid Dynamics (CFD) is now supplemented with model development for the phase separation process. Thereby, two different approaches are pursued: Simplified modeling of the separation based on swarm sedimentation and coalescence in the dense-packed zone and a more complex model also including the fluid dynamics in CFD. Additionally, dispersion and coalescence are investigated in nanoparticle-stabilized emulsions (Pickering emulsions) to identify the impact of particle properties, system composition and process conditions on the drop size distributions. Here again, the drop size analysis is a crucial characteristic for emulsion stability and the available area for mass transfer processes during reaction. Böhm, L. P. Comparison of single bubble and bubble swarm behavior in narrow gaps inside flat sheet membrane modules. Technische Universität Berlin, 2015.